Following criticism of some UK motor insurers for relying heavily on ancillary income to make a profit, GR’s sister title Insurance Times can reveal that certain of their Gibraltar-based counterparts are doing the same. 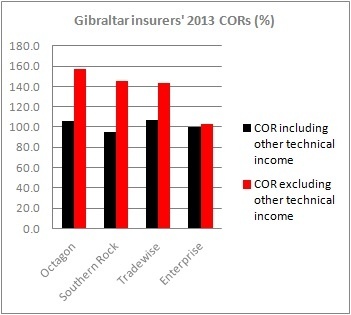 An Insurance Times study of the accounts of four Gibraltarian insurers shows that ancillary income, often called ‘other technical income’, makes up more than 50% of net earned premiums in some cases and can be the difference between reporting an underwriting profit and making a large underwriting loss. But the insurers’ chief executives have denied they are over-reliant on other technical income, and Gibraltar’s regulator, the Financial Services Commission, says heavy dependence on the income is not widespread in Gibraltar. Ancillary income is anything the insurer makes on top of income it generates from underwriting risks. It can include income from selling add-on products underwritten by other insurers, for example – an area of keen interest for the UK’s FCA. It can also include instalment income and administrative charges. Of the four companies studied by Insurance Times, Octagon was the most reliant on ‘other technical income’. Insurance Times revealed last month that Octagon had slipped below its minimum solvency requirement and was seeking extra capital from its shareholders. This income shaved 51.3 percentage points from Octagon’s 2013 combined operating ratio (COR) (see chart). Including other technical income, Octagon’s 2013 COR was 105.8%. Excluding it, the COR would have been a far less flattering 157.1%. Octagon’s accounts show that its other technical income comprises instalment income from financed policies and fees charged for policy amendments. It also includes a payment received from subsidiary company Octagon Insurance Services. Octagon was by no means alone in relying on other technical income. Southern Rock ‘s other technical income transformed what would have been a loss-making COR of 145.1% in 2013 into a comfortably profitable 94.7% – essentially knocking 50.4 points from the COR. Similarly, Tradewise enjoyed a 35.7 point boost from its other technical income, which improved the COR to 107.2% from 143%. The exception among the four companies studied was Enterprise, which only enjoyed a 2.7 point benefit from other technical income – although this was enough to push the company into underwriting profit from a small loss-making position. Some feel that insurers in general are forgetting the fundamental principles of insurance underwriting if they rely too heavily on ancillary income for underwriting profits. Shore Capital analyst Eamonn Flanagan likened insurers’ reliance on ancillary income to car sellers making a loss on the sale of the car itself but profiting from the after-sale service and financing. He says: “I think the industry, not just Gibraltar, has got away from the fact that [insurance underwriting] is premiums less claims and expenses and has gone more towards the automotive industry. “It could be that you will write insurance as a loss-leader in the knowledge that you will make it up on ancillaries, adjustments to policies and instalment income. He adds that the COR calculated from Southern Rock’s statutory accounts are skewed by reinsurance arrangements, and the company’s CORs calculated on an underwriting year basis from 2011 to 2014 “allow us to be profitable excluding income that is classified as other technical income in the statutory accounts”. Octagon chief executive Chris Hill did not respond to questions about his company’s other technical income. Gibraltar’s FSC also seems unconcerned by companies’ reliance on ancillary income. FSC prudential head Joe Perdoni says: “I am unable to comment on individual cases except to say that in general the business models of Gibraltar insurers do not rely heavily on non-risk or ancillary income. “Where those insurers are part of international groups such non-risk and ancillary income, if earned, is generally earned by non-Gibraltarian group companies. Insurers may not be concerned, but if sources of ancillary income are squeezed by regulatory pressures, some companies may find it far tougher to make underwriting profits in future.